I’m interested in Jeiqi and started working with it. However I realised there there has not been any work yet on its standardisation. It should be done ASAP to avoid having too many standards later. Bellow is a basic proposal. Jeiqi (in Chinese: 揭棋, in Vietnamese: Cờ Úp, probably other names in English: uncovering / dark / unveiling chess / xiangqi) is a Xiangqi (Chinese chess) variant rising star when the number of players grows rapidly, especially in China and Vietnam. 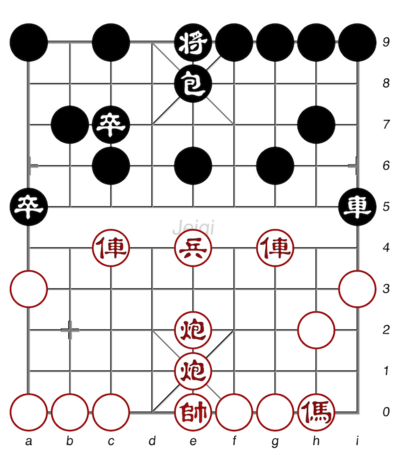 3) Captured pieces (the original one is Castling availability): Both Xiangqi and Jeiqi don’t have castling moves. Instead we use this field for recording captures because it is very important to guess to which piece a dark piece could be revealed. We write down all revealed captured pieces and their numbers but ignore ones with no capture. We don’t need (not compulsory) to write down dark captures as well since we can calculate them from the board and revealed captures. That can make the FEN string a bit shorter, avoid redundancy and inconsistent data, avoid ugly using 2 digit numbers (dark pieces could be 15 - two digit number). However we may not be so strict in this issue (have or have not dark captures). 4) En passant: ignore. Use ‘-’ instead. 5) Halfmove clock: similar to chess. This is the number of halfmoves since the last capture or pawn advance. 6) Fullmove number: similar to chess. The number of the full moves. It starts at 1, and is incremented after Black's move. For example, in above board even there are two black Rooks in column 9, their moves can not be ambiguous since r9.1 is definitely by revealed Rook and r9.1=c is definitely by dark one. For uniformity with FENs for other variants, I would prefer the captured pieces to be enclosed by [brackets], and appear immediately after the board (so before the side-to-move indicator). This is what WinBoard does in Crazyhouse or Shogi (where the captured pieces can be dropped), or in SuperChess, Grand Chess and Great Shatranj (where the captured pieces can serve as promotion choice). The field doesn't represent something that is anything like castling (unlike the 'virginity field' in Seirawan Chess), so there is no reason why it should appear in its place. Note that Crazyhouse has both castling and recycling of captured pieces, and would in any case need both fields. A GUI implementation would likely show the captured pieces in JeiQi in the same way as it would show those in Grand Chess, or perhaps Crazyhouse: in 'holdings' beside the board. (Although flipping color does not seen useful here.) Using a uniform notation for such holdings in FEN makes sense and simplifies GUI design. I would prefer the use of X,x for unrevealed pieces, rather than D,d. Thanks Muller a lot for your feedbacks. Just note that many Jeiqi websites use a total number next to a capture piece to reduce the list and delete the need to count them (unrevealed pieces may be 15 for each side). hgm wrote: I would prefer the use of X,x for unrevealed pieces, rather than D,d. That is fine too. We will use X, x. Actually I don't like D, d either since it doesn't look "special". Well, Shogi players seem obsessed with making things as incompatible with anything else in the world as possible. They use letters for ranks and numbers for files in SAN, they call the side that has the first move black, they made their own engine protocol by changing some keywords of UCI... So it should be no surprise there is a separate 'SFEN' standard that is incompatible with FEN. WinBoard does not use that even for Shogi. Do you (and WB) have any problem with the format of capture-number, say [e1a2R1X4]? We prefer number to none since X (dark piece) can be as many as 15. The best is let users can use both (with or without number).